I built this box as a Christmas gift for my daughter. Since her name is Rosana, it seemed appropriate to use Brazilian rosewood. The body of the box is rosewood and maple, with padauk and brass providing accents. Finished with shellac. The box top is of course inspired by Kent Shepherd's box and ruddy's box. As soon as I saw the design, I knew I wanted to try it out. The elegance was exactly what I wanted here. This box had many firsts for me. I laid in the mortises for the Brusso quadrant hinges by hand, following this tutorial. It seemed easier than trying to set up a router template and try to balance a router on the edge. The results weren’t perfect, but not terrible for a first attempt. This was also my first inlay of something other than stringing. It took me several iterations before I could get it right. I tried to be clever and cut the inlay from padauk veneer using my Silhouette Cameo paper cutter. The cutting knife had a tendency to get caught following the grain, getting out of position for the rest of the cut. So I switched to cutting by hand (actually, I gave up and had my wife cut it—she’s got a steadier hand than I do; I’m going to have to practice!) and then transferred the cut shape to the inside of the lid with a hobby knife. Then I routed the shallow mortise for the inlay with my Dremel using the precision router base and a 1/32 in. inlay bit from StewMac. The feet were also a challenge. I ended up building them twice. The first time, the walls that were supposed to be glued to the body of the box turned out very rough. I made some adjustments the second time around, and they turned out much better. Finally, this was my first time making velvet inserts for a box. I decided to make actual inserts instead of using flocking paper. I made the inserts by cutting the stiffest interfacing I could find to the shape of each tray, and then gluing the velvet fabric to it using Super 77. I learned a lot on this project. Happily, it was well received, which is ultimately what it’s all about in the end. Charlie, that is a wonderful box! I really like the legs and the way you did the lid! From the picture of your Daughter, It was well received. I’m betting she’ll keep it forever. Nice work. Beautiful jewelry box. Wonderful design and super woodcraft. It is easy to see the thought that went into this creation. Don,t you hate to make kids cry. I,m gonna sent you my name to ship me your swap box. Glad your in. Wow, that’s one amazing box, great build. Oh my! What a beautiful box. Rosana is a very lucky lady! beautiful box,i love the design and it looks like rosana does too,and it doesn’t get any better than that.nice job. Beautiful box! 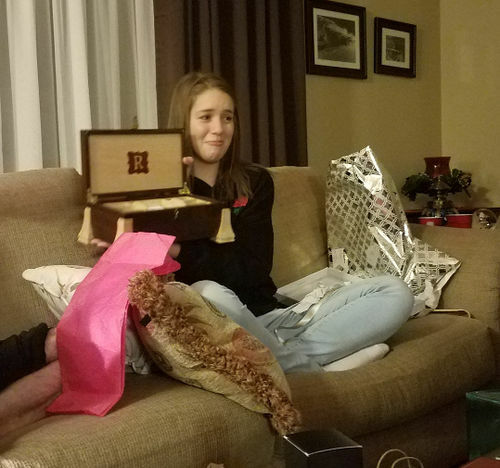 Seeing her reaction makes it all the worthwhile. We need more of this on LJ. Beautiful box with so many thoughtful details. Love the expression on your daughter’s face…that is priceless. Thanks for sharing all the details. Great job. I like the “string of pearls” inlay on the top -very appropriate for a jewelry box without being overly ornate. This will surely be passed down to future generations. Thanks for posting. beautiful lines. Love the legs. You can see her appreciation. Really nice work on the box. The last picture IS worth 1000 words-great job. All the details – turned out awesome.